Now that we have the boat back, I was able to tackle what was the easiest part of this project. I just needed to mount the accumulator tank and the pump on the new filter platform, and run new hoses between everything. I pulled all the old plumbing out and took it back to the house. Here is everything mounted up and ready for the hose. I hauled the whole thing down to the boat. Turns out it was too big to fit through the doorway. I had to take it through a window. Not one of the windows in the photo. A big one. And here is the place where it is going to live. I stuck a foam plug in the end of the water line coming from the tank. That was easier than searching for the shut off valve under the lazarette. The filter canisters have o-ring seals on the top. 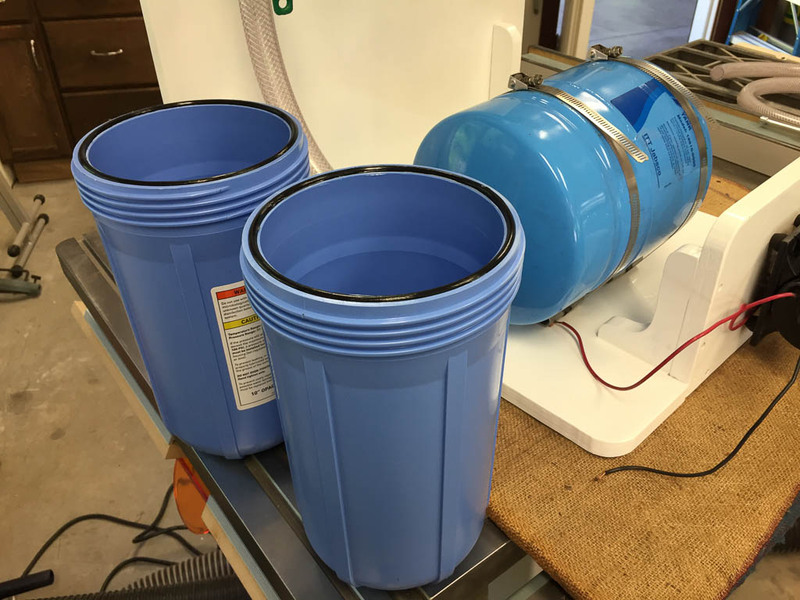 The seals need to be greased when the filters are installed and the canister is tightened to the top. I am using this food grade synthetic grease. I coated the o-rings when I mounted the filters. I also used a bit on the new hoses. They slid on the fittings easily. I don’t think I used enough grease the first time. One of the canisters leaked. I opened both up and added a bit more grease to the seals. No more leaks after that. And this is what I ended up with. It’s a bit bigger than I thought it would be. And I needed to make an upright on the right side to support the platform. The one there now is temporary. I’ll make a permanent riser when we get home from the San Juans. The hose run on the right looks awkward to me. There were also a few minor leaks. I was able to resolve all but one. Turns out there is a tiny leak where the small brass fitting between the filter housings connects to the right filter. I need to take the filters off the brackets, disconnect a hose on the right, and tighten that fitting one turn. That should do it. I am pleased to report that it all works great. 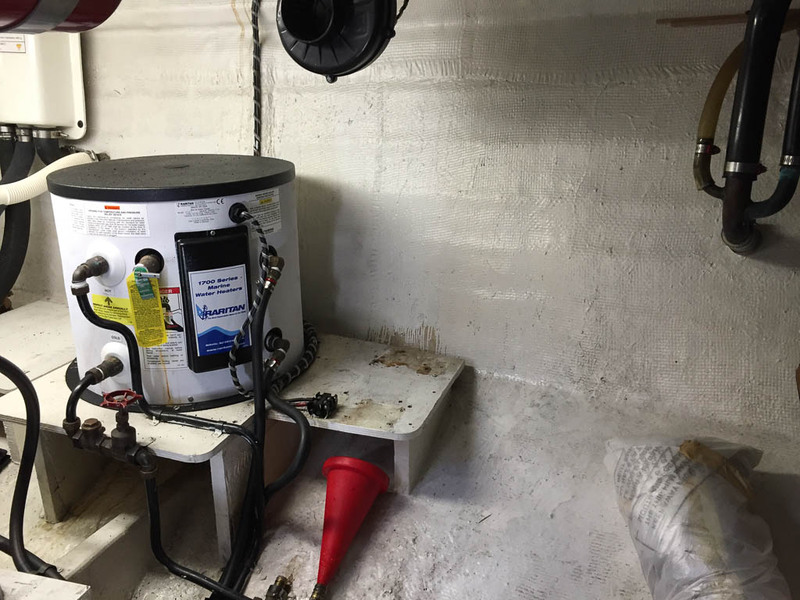 The addition of the filters hasn’t negatively impacted the water pressure. I was worried a bit about that. That’s why I started with 5 micron filters. The water tastes great too! After all that work, I didn’t really like what I ended up with completely. It bugged me the way the hose from the pump to the first canister ran. It looked awkward. The location of the pump and the angle of the hose connections was wrong. So I turned the pump 90 degrees. This configuration seems to “flow” better to me. I am going to call this project done. Time to go relax on the boat for a while. I’ll do a follow up after we’ve lived with it for a while. Maybe around the time the filters are changed for the first time. That will be in 3-4 months time. 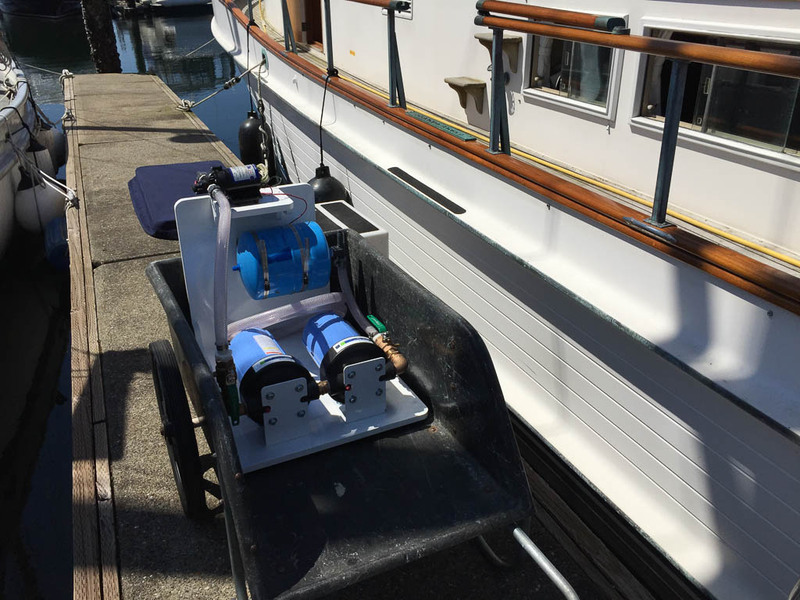 This entry was posted in Gear, Interesting, Projects and tagged Archimedes, Big Blue, boating, Grand Banks, Grand Banks 42, Pacific Northwest, Pentek, Pentek Big Blue, Poulsbo, Puget Sound, Salish Sea, Seattle, Trawler, Water Filter, Water filtration by Rusty. Bookmark the permalink. Great job! I am definitely going to look into the larger filters as mine is still struggling to push the water through my .05 micron filter, even though the pump is supposedly big enough. Hi Steve. 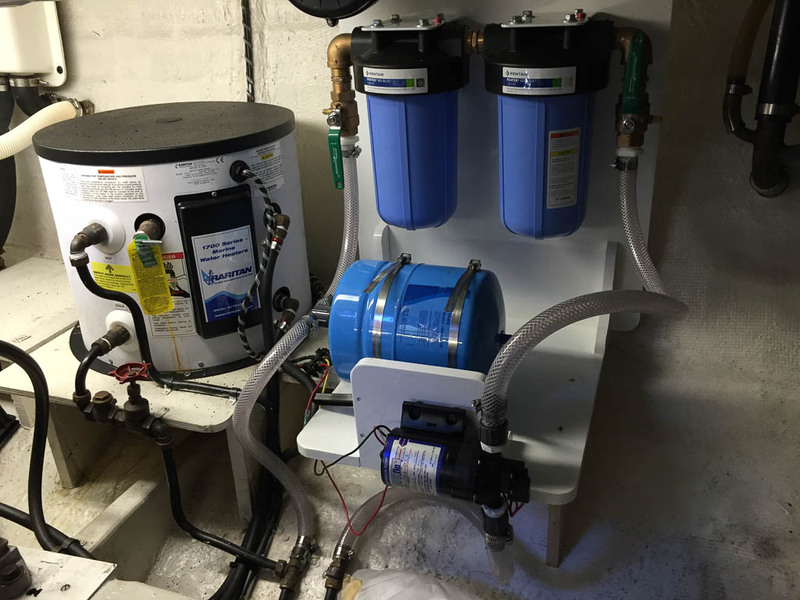 After several days of typical use we have experienced no loss of water flow using the 5 micron filters. Everything is going well so far.